The RH200 Series has been discontinued. Please see the RH318 as a possible alternative or contact our Temperature Engineering Department. 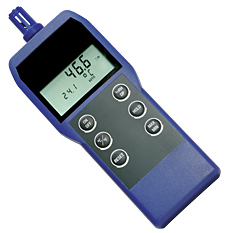 The portable, rugged RH200A/201A hygrometer/thermometers accurately measure relative humidity and temperature, displaying the reading on a large LCD. Applications include heating, ventilation, air conditioning and refrigeration, food production and processing, and building management from hotels to art galleries and museums. The RH201A has a removable temperature and humidity sensor that allows the user to take readings whenever needed. The humidity component of this sensor is capacitive, resulting in quicker readings; the temperature thermistor component improves accuracy. The sensor plugs into the base unit via a specially designed 8-way lumberg connector. The RH201A comes with a fitted carrying case. The RH200A’s temperature/ humidity sensor is built-in—for quick and convenient checks. 참고: All units come with 2 “AA” alkaline batteries, probe and complete operator’s manual. The RH201A comes with a rugged carrying case.